Think of Random Access Memory (RAM), sometimes referred to simply as memory, as the short-term memory of your computer. RAM data can be recalled without having to access the hard drive, which is why having the right amount of memory in your computer directly correlates with performance. Without diving too deeply into the science behind computer memory, understand that RAM lets your computer run faster and more smoothly—especially when multi-tasking—if you are someone who likes to have several programs open at once. Why might you consider a RAM upgrade? Making a RAM upgrade is a question of performance. If you notice that performance is slower than you would like it to be during a specific time, the Task Manager in Windows is a good way to check whether you are overtaxing your available RAM. 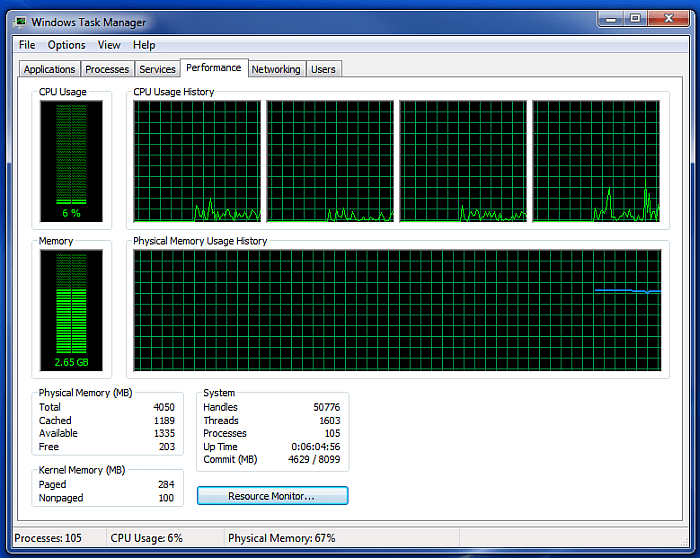 Open the Task Manager in Windows 7 or Windows 8 by pressing ALT + CTL + DEL. Click the Performance tab. The box called Physical Memory (MB) gauges your RAM usage. A good rule of thumb is that if the Available Memory is less than 25 percent of your Total Memory, a RAM upgrade will provide a tangible performance boost for the end user. Watch your RAM performance especially when you open a new application. If this occurs slower than you would like, and you notice that usage spikes closer to 100 percent of capacity, then a RAM upgrade might serve you well. First, note that laptop memory and desktop memory are different and not interchangeable! Let this be the first step in selecting the right RAM for your specific computer. The two components that most affect the type of RAM you should select are your motherboard and your operating system. Your computer’s motherboard will also determine RAM capacity, as it has a limited number of dual in-line memory module slots (DIMM slots) which is where you plug in the RAM. Consult your computer or motherboard manual to find this information. DDR2 SDRAM (double data rate synchronous dynamic random-access memory) – Commonly found in computers made after 2003. DDR3 SDRAM (double data rate type three synchronous dynamic random-access memory) – Found in computers made after 2007. DDR4 SDRAM (double data rate fourth generation synchronous dynamic random-access memory) – The newest generation of RAM that is found in the latest PC builds. Speed (MHz) – Unless you are benchmarking performance you probably will not notice the difference between an 1866 MHz memory module and one that is 1333 MHz. Speed considerations are more important for server workstations that handle larger computing loads. Timings (Latency) – Timing or latency of RAM is represented as four numerals separated by dashes. Typically, lower numbers mean better performance. Multi-Channel Kits – If your motherboard supports multi-channel memory, a matching kit optimizes performance. To accommodate this, RAM can be shopped on the basis of system-specific memory. NeweggBusiness has a memory finder built into our site. It provides vendor-neutral specifications and product suggestions to locate find memory that fits a specific system. You can access it here. Several memory vendors have similar tools. Remember to shop smart—write down the model numbers suggested by these tools and check the pricing against the NeweggBusiness memory store. Please share any additional tips for choosing a RAM upgrade in the comments section. Random Access Memory (RAM) helps your computer run faster when multi-tasking. Here is what to take into account for making a RAM upgrade. Thanks for pointing out that RAM is a question of performance and that you could be overtaxing your current setup. I also liked your rule of thumb for available memory staying above 25%. I think it’s a good idea to look at online reviews of certain brands of RAM and how they perform in your specific computer. Thanks for your article. I was wondering what the MAX RAM for a 64-Bit Windows 7 Home Premium is? Hope to hear from you soon. It would be nice if NeweggBusiness continued to sell Kingston RAM. Since it doesn’t, I have to purchase it elsewhere at a higher price.